Hello everyone: 3D cards are fun to make but, since I really don't make them often, I totally need to check out a bunch of videos on the subject to kind of refresh my memory, I'm a very visual person, I need to SEE stuff being made, specially if I have to make "stuff". This week over at SHOPPING OUR STASH, we want to see you make STEP CARDS. There are a lot of videos out there and other places have really good still pictures with measurements and everything but, I need a video so, among the bunch I watched, I found THIS ONE BY BEATE JOHNS that is short and to the point. On the top of the page, before you scroll down for the video, there are pictures and measurements for the card she's making, which is awesome and small enough to mail. So here is my card using Beate's directions, that I hope will inspire you to join my teammates and I in the SHOPPING OUR STASH gallery. 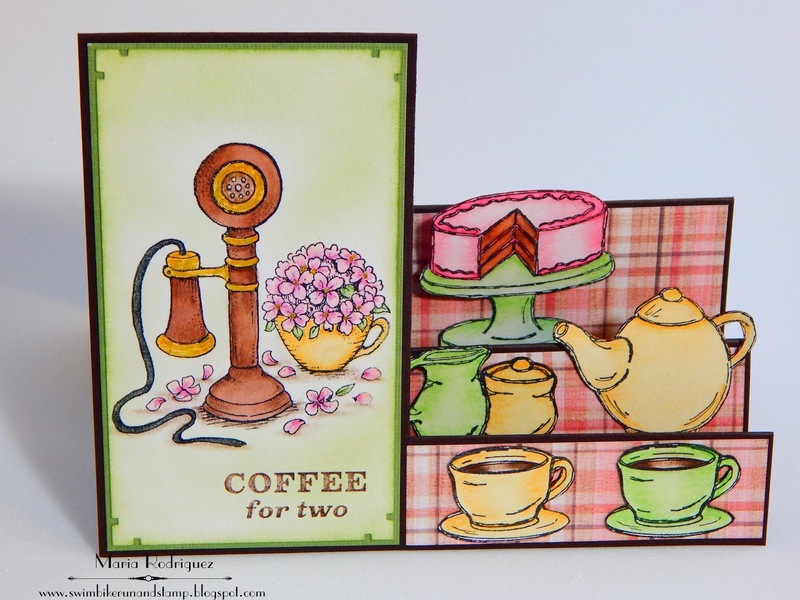 The old fashioned telephone is from a retired Flourishes set called "Call Me", I picked this particular image because that little cup with the Pansies looks a lot like the cups on this awesome set from Cornish Heritage Farms called "The Cafe". 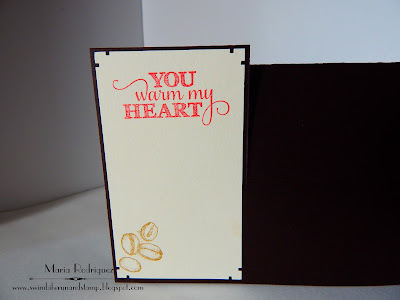 I stamped all the images onto Strathmore mixed media paper with Stazon black ink and colored them with Stampin' Up! markers, an aqua painter and Prismacolor pencils. The pattern paper is from a discontinued line from Lili of the Valley. After I stamped and colored the cake, coffee cups, coffee pot and creamer and sugar bow, I fussy cut them and glued them to the panels. I went and created a little panel for the inside, just to write a little note. Here is a picture of this card a bit sideways, just so you can appreciate the step design, also a picture of the panel inside. I hope to see you in the gallery, for more inspiration, hop over to the SHOPPING OUR STASH challenge blog and check out my teammates' creations. I'm linking this card to a couple of challenges. 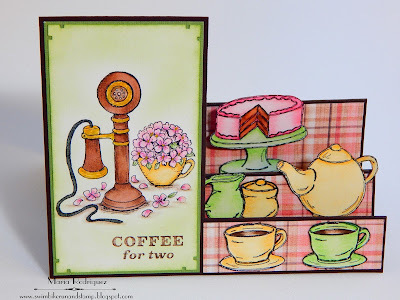 Stamps&Fun=Creativity challenge #298 "From the Kitchen"
Crafting from the Heart challenge #152 "Always Anything Goes"
Hello everyone: We have a new challenge for you to play with over at RETRO RUBBER, this time is a fun sketch. There are lots of possibilities, so come on over and play, we can't wait to see what you create. Please remember to use your OVER ONE YEAR OLD STAMPS, please tell us their age and also, limit your challenges entries to 10, including ours. 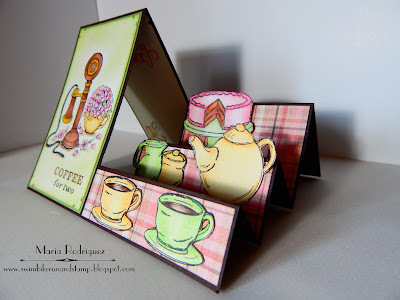 Here is a card I created to inspire you and, for more inspiration, hope over the RETRO RUBBER challenge blog and check out my teammates creations. 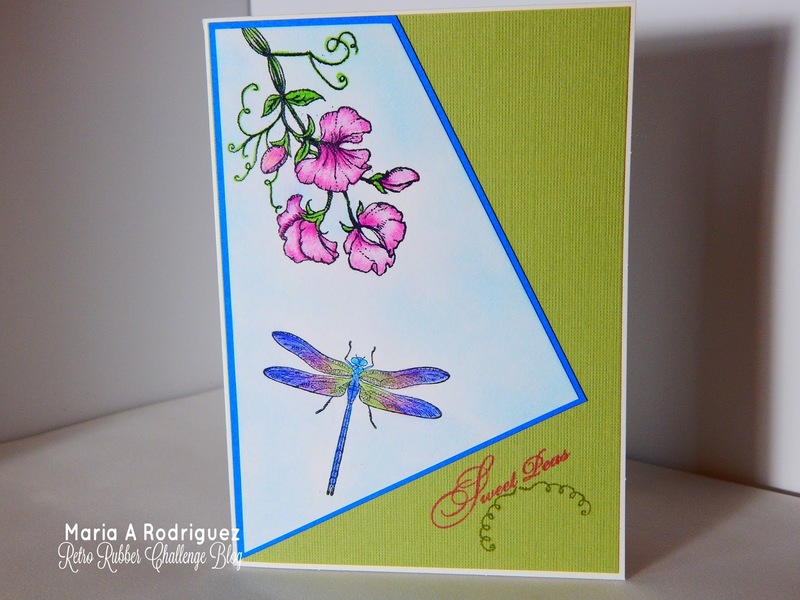 This card was made with two very old stamp sets. The beautiful Dragon Fly is from a retired Stampin' Up! set called "Nature's Nest" that dates back to 2009-2010 Catalog. The Sweet Pea flower is from a retired Flourishes stamp set called "Sweet Peas", this one dates to 2012, same year I bought it. I stamped my images onto a panel of Strathmore multi media paper with Stazon black ink and colored them with Prismacolor pencils and paper stumps dipped in baby oil. I wanted to make sure the Dragon Fly was colored as close to the real thing so I Google it and found out that this amazing jewels come in all kinds of gorgeous colors, I kind of used this picture to color mine. How gorgeous is this winged jewel? The sentiment and the vines are from the same set.